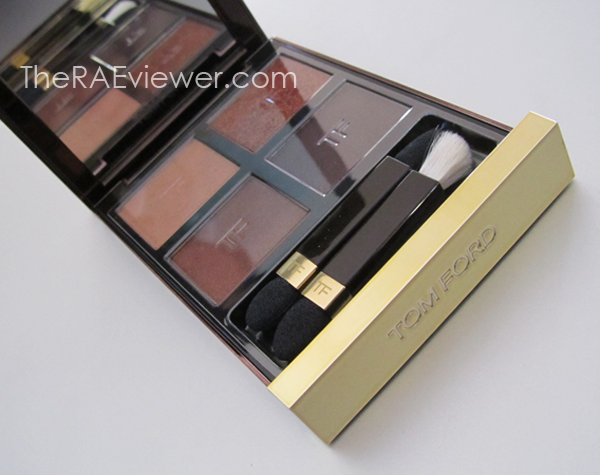 I generally prefer cool brown shadows to warm brown shadows but Tom Ford's eyeshadow quad in Cognac Sable (which I ordered from Bergdorf Goodman) has temporarily, at least, altered my preference. 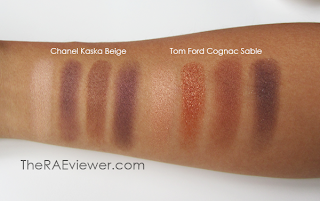 Though I do own individual shades or duos that may be considered 'dupes' for the shades in Cognac Sable, the only quad in my possession that comes close to Cognac Sable is Chanel's Kaska Beige (now discontinued). Kaska Beige, however, is a mix of warm and cool tones whereas Cognac Sable is strictly warm. 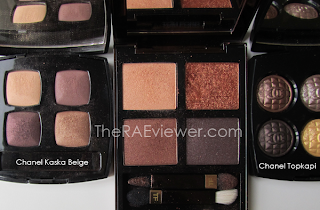 These two palettes look more similar once applied to my eyes, since both ultimately create a bronzy, smoky effect. The golden peach shade is similar to Lancome's Kitten Heel, though the texture of TF's shadow is superior (smoother and more pigmented). 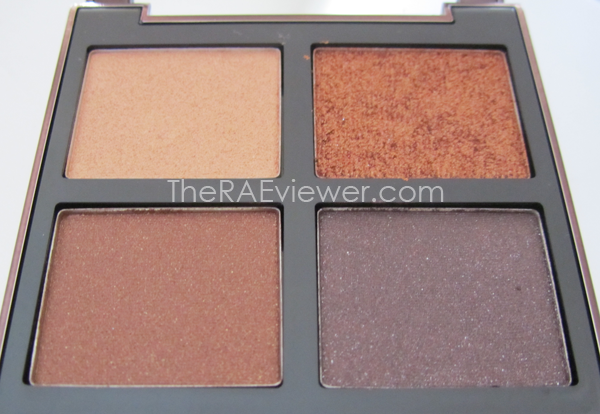 I don't have anything like the glittering orange-bronze in Cognac Sable, though the base color is similar to D&G's orange-bronze in the Gold duo (one of my favorite eyeshadows of all time). The warm medium brown and deep chocolate could probably be duped by MAC or any other premiere eyeshadow brand but the texture is what makes them unique. They are matte shades with a touch of shimmer particles running through them. In the pan, they look to be cohesive but once applied to the eyes, the shimmers do sit on top of the shadows. I don't mind that look at all but many prefer shimmers that are infused into the base colors of shadows so I figured it was worth mentioning. The eyeshadows were swatched on my bare arm but on the eyes, a primer is necessary for oily lids. I found they work best with my NARS Pro-Prime eyeshadow base. 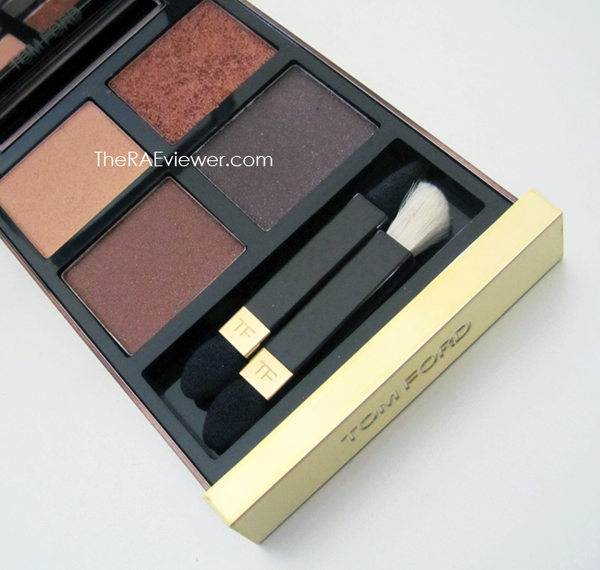 Some have found that the colors look better swatched than applied to the lid but I have discovered the more I play with this eyeshadow palette, the more I fall in love with it. 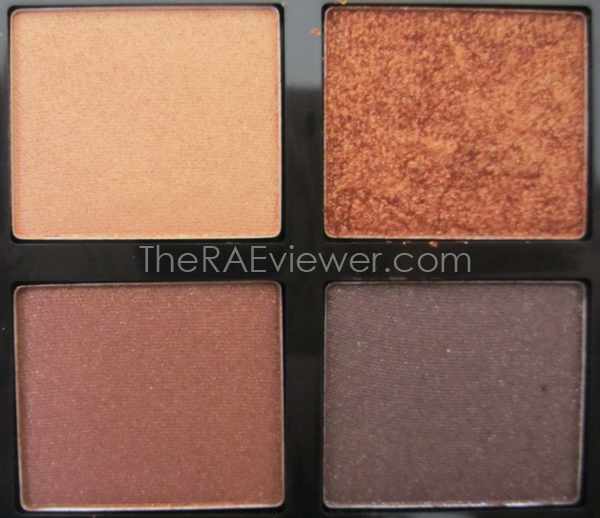 The colors coordinate beautifully and I can use it to create both naturally brightened or dramatic, smoky eyes. It's now officially the one warm eyeshadow palette I will travel with. The case could have used some extra weight, but the extra large mirror is a compromise that I do not begrudge. I'll be posting a full video review and tutorial using all the Tom Ford Beauty products I purchased and I have to say, it's one of my favorite looks of all time! It's very warm, not too neutral, and simply sophisticated. Here is a full-face preview of my Tom Ford Beauty Look! Close-up of CS on my eye! 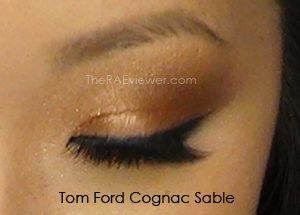 Bottom Line: Tom Ford's Cognac Sable Eye Color Quad may not change your life, but it is admittedly a gorgeous indulgence! I can hardly wait to see your tutorial. The preview picture of your TF look is glam yet elegant. You look stunning, Rae. oh my god you are so beautiful! greetings from Finland Europe :) !! I just ordered the Cognac Sable quad, and i'm considering to order Golden Mink and Coca Mirage as well. Do you have any idea of their color? I want to order another 2 eyeshadow quads called Golden Mink and Coca Mirage. Do you have any idea of these colors? Thanks for the great feedback, everyone! 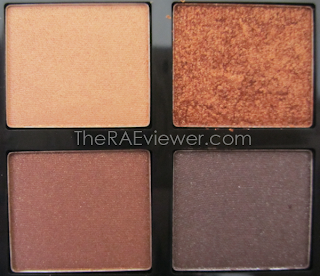 And Dorothy, I have not purchased any other quads but I'm sure you can find other reviews/swatches online. Good luck!